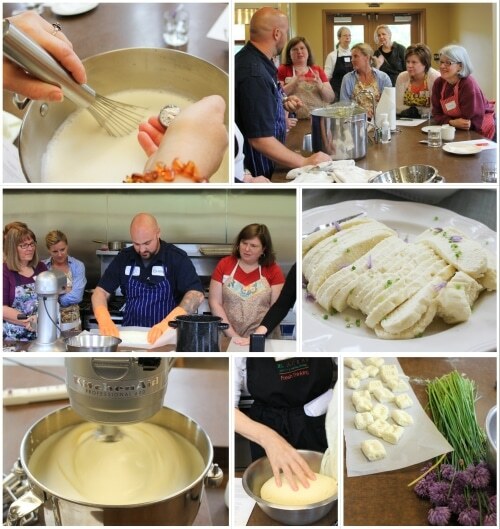 The cheese making course held this May was a great success. It was a full class and we all got to take home some butter and cheese from the day. It was very hands on, and we all got to experience the cheese making process for ourselves. Chris Feller, our teacher was fun and informative. We started off by making a simple ricotta. We used beautiful organic milk from Fresh breeze organic dairy. The milk was divinely creamy and rich – prefect for fresh cheese. It was an interesting process making the ricotta, and we all got involved straining the curds and whey. We whipped up a huge batch in no time. We then moved onto mozzarella. We were all surprised at the huge amount of milk that was required to make a relatively small batch of mozzarella. This was a bit trickier to make and required a little more effort and attention. Chris was patient and helpful and ensured we ended up with perfect mozzarella. We then quickly whipped up a batch of butter. Butter making is so simple, and the end result is always so much nicer than anything you will buy. We finished off the class by preparing a meal from our delicious cheese. We made simple ricotta gnocchi with a brown butter sauce. The ricotta gnocchi is so much tastier than the bland potato gnocchi and was a cinch to make. We then all sat down to eat and talk about cheese making. We ate some delicious bread (from 21 Acres kitchen) slathered in home-made butter. We had some of our ricotta and mozzarella garnished with fresh herbs from the 21 Acres farm. We also had our hot ricotta gnocchi with that lovely nutty brown butter. It was a busy morning, but we got a lot done, and learned a great deal in the process. 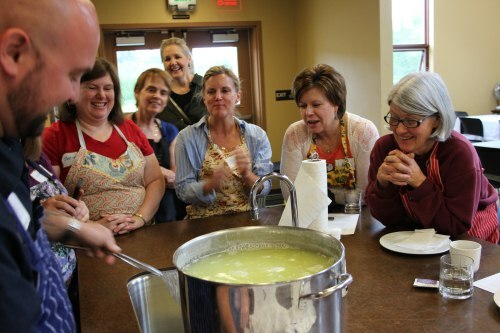 This is a wonderful class to learn basic cheese making. Chris gave us some great tips about dairy and the various ways to make different types of cheese. We were busy throughout and it was lovely to be able to take home the spoils from the day.